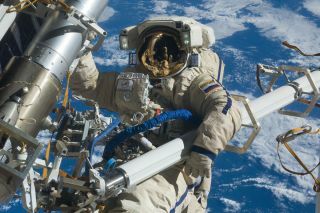 Russian cosmonaut Anton Shkaplerov conducts a spacewalk in 2012. Two Russian cosmonauts will conduct a 6-hour spacewalk today (Aug. 15) to launch small satellites and take care of a couple scientific tasks. You can watch the spacewalk live here at Space.com, courtesy of NASA TV. The broadcast begins at 11:15 a.m. EDT (1515 GMT), and the cosmonauts are due to leave the International Space Station at 11:58 a.m. EDT (1558 GMT). The spacewalk will be the first excursion for Sergey Prokopyev and the third for Oleg Artemyev, and it will be the 212th spacewalk in the International Space Station's history. In anticipation of the spacewalk, Prokopyev and Artemyev have been working on their spacesuits, including attaching GoPro mounts to allow them to capture live footage during their spacewalk. The cosmonauts also received a care package full of meals and Russian candy to help them fuel up for the long excursion. Prokopyev and Artemyev have a substantial to-do list during their spacewalk, mostly focused on scientific research taking place at the International Space Station. They'll launch four separate satellites by hand and bring back, for further analysis, samples that have been attached to the outside of the space station, according to a statement from NASA. The cosmonauts will also need to install a new experiment, called ICARUS, which is a partnership between the Russian and German space agencies. ICARUS is designed to study animal migrations and the spread of diseases on Earth by gathering data from GPS tracking devices.